If you thought our restoration team's skills were limited to sanding and applying a new finish to your existing original parquet floor, we've got news for you. They can knit too! When the layout in one room was changed to increase the space our client asked if we would be able to fill the "new space" with original blocks - lifted from another room in the house - in such a way the pattern would continue to and around the wall. The left picture shows where the original border was - with the last row of cut herringbone blocks. Both border and last row were carefully removed from the floor - you can still see their "print" on the old bitumen layer - and the "reclaimed" blocks were waiting to be "knitted" in. Only to discover those blocks, although from the same house, were slightly wider and longer than the blocks in this room! A carpenter - already on site with his work bench - was set to work to cut 3 sq meters of blocks to their new size. The original plan had been to continue the herringbone pattern around the wall, where a "snug" had been created. It was then decided, due to limited blocks available, to add a border between the "snug" and the main area, instead of cutting all the "reclaimed" blocks to new size. The pitch-pine floor was finished - on time for the planned moving home date - with an colour oil. Hello, We are going to extend our floor area of basket woven wooden tiles, size 2x11.5 cm, 5 strips make one square. We can only find second hand matching tiles. After cleaning the the edges of the strips, can they be glued good side down, making a patterned square, onto a base, which then can be glued to the cement floor. The top will then be sanded smooth to remove bitumen/cement. The cleaned floor will then be fine sanded and sealed. What kind of adhesive can be used to preglue the tiles on some kind of a base. What kind of base can we use for this? Surely each strip does not have to be glued individually onto the cement floor? One should be able to make a larger square first, for easier laying. Thank you so much for giving us advice on this. Looking forward to hear from you. Kind regards and Merry Christmas. Thank you for your question. These mosaic floors normally come in tile-form with either "mesh (string) backing" or felt-backing. Would the mahogany we have available not suit you? Otherwise, cleaned "fingers" can be glued individually to the concrete (and you'll be surprised how quickly you can do this once you get the "rhythm"). Often works better than trying for form a blocks of fingers first and installing the 5 fingers together. Hope this helps and Merry Christmas to you too. Hi, So impressed to have got an answer so instantaneously!! We most likely will try to lay the "fingers' one by one, as you suggested. What will our old knees look like? We will let you know about the end result! We are in South Africa, close to Cape Town, so we won't buy anything from you! Thought we let you know. We would like to give you an update of our flooring. We had an extension done to our house and this needed a matching continuation of our parquet flooring. The kind of parquet we needed was the ' basket weave ' pattern. We got hold of second hand pieces ( 5"x1"), dirty looking ones in bags. We bought them with a rather reluctant feeling. The wood is Kiaat/wild teak/Pterocarpus angolensis. They were all cleaned, fumigated and sorted into different colours and placed into bundles of 5 'fingers' with an elastic band put around them. The concrete floor got a 2 layer water proofing laid by a roller brush. We were fortunate to get hold of a man, Henry, who knew the trick of laying/glueing the parquet. The glue used was Pekay's wood block adhesive. The tiles were laid with the old glued side up, showing the cement still attached to the tiles. The floor was treated with 3 coats of Bona Novia. Have a look at the photos we have attached. We are happy with the matching floors. The end result looks very good. All of them went over the "sand bench"
Then they were "bundled" per 5 fingers, ready to be installed. After the floor is sanded to remove the concrete/screed and level the pattern, the manual filling of the gaps starts. Hello, we have a parquet floor in our hallway that was sanded and varnished 10/12 years ago and is now rather tired and in need of revitalisation, especially since we have rearranged the furniture and the old wear pattern is now a "feature"of the floor. Obviously we could just sand it down and do the same again, but I would like to know whether we could apply a wax finish instead once we have stripped it back - it is a 1950s house and I think the flooring is oak; I am planning on doing the job myself, but would appreciate some expert guidance as to whether a change of finish will produce good (or hopefully even better!) results. Thank you for your question. We are "oil" people ourselves and know from experience an HardWaxOil finish will bring out your floor's character much better than varnish, plus will be easier to keep beautiful without too much trouble. Yes, I have read the Easy Steps - I think I would probably join in on step 5 as our floor is perfectly sound, just worn. I really wanted to check that the varnish can be sufficiently removed by sanding and that it hasn't penetrated deep down in the wood in a way that would stop oil soaking in should we decide to change the finish. It as a relatively small area - about 14 sq m - what tools and materials (apart from hiring sanders) would you recommend we use? Varnish can normally be sanded off rather easy - you could even decide to start with grit 80 instead of 40. Try this out, it will save you time and sanding belts. How do I remove bitumen from my wood blocks? The bitumen gets brittle and looses its grip between block/fingers and the underfloor. Leaving you with more and more loosening blocks (and we've heard plenty of stories of little fingers disappearing in vacuum cleaners). Plus more often than not, reclaimed blocks are offered with bitumen still attached. the problems wouldn't be so difficult to solve. If the blocks are thick enough, the best way to remove the bitumen residue, specially if it is a thick and.or irregular layer, is to use a thickness planer. You might lose the tongue and groove, but with the modern adhesives this is not such a problem. Once firmly stuck down in their bed of adhesive (applied with a notched trowel to a clean floor) and given 24 hours to bond the blocks will go nowhere and are ready for sanding. Or, using the features of bitumen to your advantage, you place the blocks in a freezer. The cold will make the bitumen even more brittle and easier to chisel off. A stain of bitumen left on the blocks after the chiseling is not a problem, the only thing to be aware of is that it then might take 48 hours for the blocks to fully bond when stuck down with adhesive again. Trying to sand the bitumen off. This will cause friction = heath = melting bitumen = clogging up your sanding paper and even spreading bitumen back onto just cleaned areas of your block. although it can be quite a bit of work, you are restoring a wonderful and long lasting floor of which you will be proud of once the hard work has been done, plus are re-using a hardwearing floor covering and saving the planet's resources. Call it a work of love, love for natural products and nature, all in one. If you need information and "7 easy steps" to repair/restore your own original parquet floor, read our special and much read/used guide. Beneath the steps you will also find highly recommended products to use, but none of the chemicals some recommend to remove bitumen the "quickest" way. Chemicals are not really quicker and definitely not "user or nature" friendly! Since the introduction of the small packs of 5-finger mosaic we have been inundated with small (and large) orders for this Solid Wood product. There's nothing more exciting it seems than to rip out old inherited carpets in the home you just bought and discover you are the proud owner of a real wooden floor. And then the search is on when parts are missing, due to whatever building works done previously (central heating installed, or fireplaces changed). Hallway cupboards are know to have mosaic floors too and there often the missing original blocks of fingers can be "reclaimed" from. If you are out of luck there, measure one block of 5-fingers to get the size you're after to make your search and enquiries easier. The size of most readily available 5-finger mosaic species in our secure webshop is: 12cm by 12cm, 7.5mm thick. In bungalows built (or renovated) in the 1950's upto the 80's tropical species such as Mahogany, Teak and Merbau were most common, preferred - then - even over Oak. The mosaic comes on mesh-backing (tiles), simple to install tile after tile with parquet adhesive (F.Ball B91 for instance) on dry and level concrete or onto level plywood. Finishing the floor - after a light sanding - with a natural oil will bring out the species character best in our opinion. For tropical species we recommend the "tropical combo": one coat of extra thin oil, followed by one coat of HardWaxOil (in the sheen of your liking). Oak should be treated with two coats of HardWaxOil to give the best result. Here's Ton, in his workshop at home, applying Saicos Wood Wax Clear extra thin to the brand new 5-finger Mosaic sample boards. In front you can see the Mahogany and the Teak board is just receiving the first coat. If you look closely you can see two other boards hiding underneath: Merbau and Oak - which will be treated to their own finish once the top boards have received the final coat and are dry enough to be turned round. All 4 (2 double-sided) boards will be on grand display in our showroom soon. Ton and Barry - our professional installation and restoration team - have the world of experience installing all types of parquet floors, from mosaic to design patterns. If you live in Kent, give us a call on 01233 713725 to discuss the option of supply and install in one complete package. And who said you have to install straight? Add some spectacular (but simple to achieve) difference to your room by going diagonal. Normally this would create much more saw-waste, but because the mosaic consists of a whole load of little fingers which can be individually used, this is not the case here. In a way, going diagonal could be your solution when you have extended a room which has an original mosaic in an old size. Make the mosaic floor in the new extension a feature by installing it diagonal, it will look the same "pattern" even though the blocks of fingers have a different - modern - size. And none would be the wiser, the human eye is not really equipped to detect small size differences when it has to compare different "shapes". Not all old (or new) mosaic floors have to contain 5 or 7 very small fingers. Another rather common size and pattern is the 3 fatter finger mosaic: 46 x 138mm per block (and 3 times 46 makes 138, a square of three fingers). Not a standard size, but with help from our Design Parquet Manufacturer we have already been able to supply new blocks of this specific size in Iroko and Oak Prime. So if you discover an odd size fat finger mosaic floor, don't despair, just give us a call on 01233 713725 (maximum thickness of these blocks is 10mm though). And who's to stop you from using regular size blocks to form a large mosaic pattern? If you look at the size of one individual block you can determine how many fingers will make a square - in most cases that is. Many of the standard size of the so-called herringbone blocks are based on this: 10 x 71 x 284mm (4 x 71) or 10 x 70 x 280mm (4 x 70), 10 x 60 x 300mm (5 x 60) 10 x 71 x 355mm (5 x 71) or 10 x 70 x 350mm (5 x 70) - depending on the manufacturer's specifications of the blocks. Vertical mosaic - also known as hogh-kant mosaic - is a different method of putting the fingers on the mesh backing: on their side. You have plenty of FSC certified wood-species to choose from in this very hardwearing and filled with colours product. Another way to group little mosaic fingers is in a mini-herringbone pattern. This product comes in single, double and even triple pattern. Again, on mesh backing for simple installation on a dry, level concrete floor (or plywood subfloor). Call us for up to date prices and lead-times. Plenty of choices in the Retro Mosaic Wooden World! There are wood species and there are wood species. The best known and most common/popular in wooden flooring is still Oak Rustic, showing its full natural character. Often stained - unfortunately, why would you disguise nature's own beautiful colours? Recently we were asked to sand down and renovate an original parquet floor near Kent's coast. The home owners wanted the existing dark stain removed from their herringbone floor and bring back it's original Oak - so they thought - character. When we arrived on site it was immediately clear that hiding beneath the dark and knackered varnish layer lay not an Oak floor, but one of nature's most versatile in colour spectrum tropical wood species: Iroko (Kambala). Iroko (Milicia excelsa) grows in tropical Africa as 50 - 60 meter high straight and often branchless tree, with an 1upto 2.5 meter wide trunk. The wood sources from this tree various from butter yellow to golden brown, from soft pearly green to brownish red. The grain is often straight, but can have a slight wave. It contains a substance that dissolves in organic solvents which increases the drying time of varnishes/lacquers finishes. On this particular floor - as we prefer to do on all tropical wood-species - we applied one coat of Saicos Colour Wax Clear extra thin for long term protection. The oil is applied very thinly and then spread out evenly with none-fluffy cloth underneath the professional buffing machine. After this has dried, the floor is finished with solid wax, an old-fashion but very, if not the most, effective method to create the wear and tear layer. The professional buffing machine above works in the solid wax, leaving a satin to shiny and non-slippery finish, bringing the wood's own character fully to life! The end result: gone is the darkening and scruffy lacquer finish. The restoration works fully exposed this Iroko/Kambala natural full and versatile character. Wondering what your own original parquet floor is hiding beneath its old finish? Call the professionals and who knows? Your floor might be an even bigger treasure than you think. Late last year we were asked to sand down and restore an original Parquet floor, herringbone pattern. Our clients was not really sure what wood-species his floor was, it looked a bit dark: stained wood or a dark species? Sanding the wood bare and eliminating all height differences with our workhorse "Viper" re-exposed this truly unique parquet floor for the first time in many, many years. A final sanding with the "Multidisk" prepared the floor for the new finish: natural oil (from Saicos) this time to let every wood-species involved show off its own character. As final treatment the floor received a thorough buffing. Our client was amazed his floor had turned from dark and spotty into this bright, "glowing" and very, very colourful original parquet floor. If you have an original parquet floor in your home (inherited from the previous owners) the old dark and spotty finish on it might just cover a marvelous treasure too! Call the professionals to do a small test with a professional sander and who knows, you could well have a valuable floor in your own home without realising it at the moment. The sale of high-end properties continues to be strong, especially around the London area, according to one expert. Nick Pejacsevich, assistant manager at independent estate agent Douglas & Gordon, explained that the company is continuing to register a large number of people who are looking to purchase a property. He said that many of these people are very specific about the homes they want to buy, which is beginning to create a two-tier market. "If there is a property that ticks all the boxes and comes on the market, then it will sell very quickly for good money, but other properties that may have some issues are struggling," Mr Pejacsevich added. A recent study from Investec found that on average it takes between one and two months to sell a home worth £1 million or more. Homeowners who are considering selling their property could try adding quality wooden flooring (specially design parquet) to the most important rooms - which has proven to increase the chance their home will sell quicker and for more. If your property already has an original wooden floor - hidden underneath carpets - it's always worth calling in the professionals to have it restored to its former glory! When you (re)discover an existing parquet floor in your home, the first thing that comes to mind is normally: o oh, that's never going to look right again! Parquet floor rediscovered underneath carpet: partly lacquered, loads of stains, residue of carpet underlayment and height differences. In these, and many other cases, we just bring in our work horse: the Viper continuous beltsander. It makes light work of existing lacquer layers, stains and height differences, hardly producing any dust. After various sanding rounds (each with a higher grit) your floor will start to look bright and right again. It's sanded down to its bare wood again, ready for the finish of your choice - but to bring out the wood's character best we always recommend to finish with oil (HardWaxOil natural or the old-fashion way: thin oil as deep sealer, followed by wax or wax-polish for your wear and tear layer). What a complete difference a few days make! Just give us a call on 01233 - 713725 and we'll bring back its character for you (bringing our head floor restorer Barry and our work horse to the rescue). Besides supplying and installing new wooden floors, with design parquet as a specialty, we can also offer you a professional design parquet floor restore service - in the Kent area (crossing the border to East Sussex and Surrey will always be considered). Barry, our Head Floor Restore Service, will bring back your original parquet floor to its authentic lustre and grandeur. Herringbone, mosaic, basket-weave or any other pattern can be revived to sparkle again. With the professional heavy sanding equipment we use the old finish layer, most of the dents and scratches will be removed to lay bare the original wood, while keeping its authenticity as original floor. Together with you Barry will discuss the best new finish layer to apply, tropical wood-species need a different product than original Oak floors, for the best result. Determining what wood-species your original floor has can be difficult - depending on how many different types of finishes and even various stains your floor has had over the times - but Teak, Rhodesian Teak, Merbau and Oak were mostly used for herringbone, basket weave and mosaic floors in the 50's to 80's. Through our contacts with the Dutch bespoke parquet manufacturer we can often supply you with missing "blocks" in the original wood-species. Call us on 01233 - 713725 now to discuss your requirements and options. And if you are considering to add the same pattern of your original and rediscovered parquet floor in other rooms where better to go than to Wood You Like, where both the restoring of the original and installing of the new parquet floor are the specialty of the house. Often both types of jobs can be done in one go, saving you time, hassle and costs. 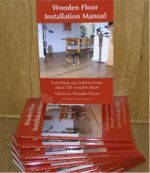 No matter if you are looking for quality flooring to install yourself - with help from our Wooden Floor Installation Manual - or have it done professional, we can cater for your needs. Wood You Like's installation service covers the whole of Kent and crosses over to Sussex and Surrey if so required. And the quality wooden floors from our ranges can be delivered anywhere in the UK (mainland). When you move to a new home you might not even know there is a treasure hiding beneath the floor-covering you inherited from the previous owner. After the dust of your move has settled why not go on a "treasure hunt" especially when you already decided to change the existing floor covering (the carpet could not be to your liking, or the vinyl is more torn that expected). Lift a small corner of the carpet/vynil and see if there is an original parquet floor hiding, if not then that's a pity and you could decide to have a brand new wooden floor installed instead. But very often the previous owner(s) had carpets installed over neglected mosaic or herrignbone/basket weave floors when wall-to-wall carpets came into "fashion" and the then laboursome maintenance of wooden floors became a thing of the past. But since maintenance with all the new modern finishes available - even for existing floors - is no longer laboursome it would be a shame to keep your rediscovered treasure hidden and/or uncherished. Parquet floors, be it herringbone or mosaic - are charateristic to older properties. Keeping the style of your interior, including the floor covering, consitent with the period the house was built in will be in yours and the home's best interest. By keeping the style of the house, the house will keep its value - or at least more than when the interior is turned (too) modern and period features are abandoned or (gasp) ripped out and sent packing in a skip. Decision time: restore or cover up, diy or professional? Restoring an original parquet floor is always worth a try. You can find plenty of help online, for instance with Wood You Like's own "7 Easy Steps to Repair/Restore your Original Parquet Floor". Sometimes all your rediscover treasure needs is a good cleaning, for which you can turn to our other guide: "3 Easy Steps to Clean and Maintain your Original Parquet Floor". Modern eco-friendly products and modern tools can help you with the "elbow grease", and you should always consider it a "labout of love". Once you brought back your floor's original grandeur you'll be proud of yourself, and the envy of the neighbourhood! For a rough estimate of costs for a DIY job: between £ 5.00 - £ 15.00 ex VAT for materials, plus hire costs for professional sanding equipment: between £ 50.00 - £ 95.00 per day (take care you hire the correct sander, drum sanders are not really recommended for parquet floors; always look for a contiues belt sander of at least 65 kg or a Triosander). Professionals floor restorers have plenty of experience with the heavy equipment, know when and where which tool needs to be used and which finish would suit the wood-species and your circumstances best. Again a rough estimation of costs: depending on the finish materials required a professional restore service will be between £ 35.00 - £ 55.00 ex VAT per sq m including the sanding equipment and finish materials and will be done quicker, plus of course guaranteed (certain conditions and distance can effect the exact price). Besides supplying and installing new wooden floors, with design parquet as a speciality, we can also offer you a professional design parquet floor restore service - in the Kent area (crossing the border to East Sussex and Surrey will always be considered). Determening what wood-species your original floor has can be difficult - depending on how many different types of finishes and even various stains your floor has had over the times - but Teak, Rhodesian Teak, Merbau and Oak were mostly used for herringbone, basket weave and mosaic floors in the 50's to 70's. Through our contacts with the Dutch bespoke parquet manufacturer we can often supply you with missing "blocks" in the original wood-species. And if you are considering to add the same pattern of your original and rediscovered parquet floor in other rooms where better to go than to Wood You Like, where both the restoring of the original and installing of the new parquet floor are the speciality of the house. Often both types of jobs can be done in one go, saving you time, hassle and costs. Visit our showroom to discuss your plans and projects and we will be able to give you an indication of total costs straight away, where after you can decide to have a site survey done.